Ground venison is a very and occasionally gamey lean meat that comes from deer, and its texture is generally improved by mixing in pork sausage or beef. Beef and pork complement the flavor of ground venison, and contain enough fat to hold the meat together in a patty and prevent it from drying during the cooking process. Aim for a fat content of around 10 percent to create a juicy burger, or higher if you want to make sausage. Trim the external fat of fresh, cooled venison with sharp knife. Discard the trimmings. 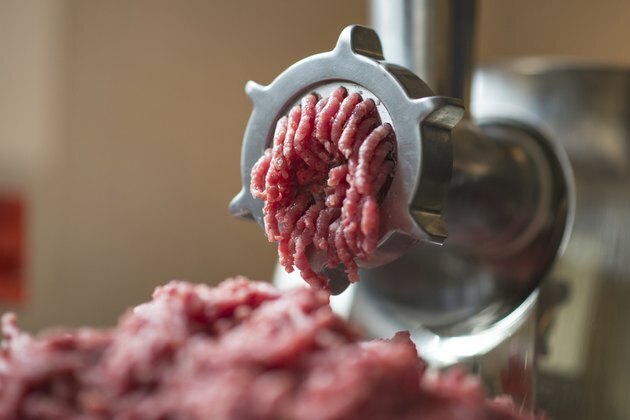 Use a meat grinder to process the meat into the desired texture. Keep the meat cold while processing to prevent an environment for bacterial growth. Weigh the ground venison with a food scale. Use this weight to determine the amount of ground beef or ground pork sausage to add. Add equal amounts of ground pork sausage or ground beef with a 20 percent fat ratio to the ground venison to achieve a 50/50 mixture. Use the food scale to add the correct amount. You can add 25 percent pork and 25 percent beef for three-meat mixture. Process the meat combination with the meat grinder, or combine it with your hands, without mashing the meat excessively. Mix in meat seasonings of your choice to mask the flavor of the venison, if desired. Prepackaged venison or grilling spices are available at most grocery stores. Add pork tallow to the ground meat mixture if you want to increase the fat content for making sausage or grilled burgers. Aim for a quantity equal to 10 percent of the total weight of the ground meat. Deer fat is not palatable and does not melt well, making it a poor choice for adding fat to your ground meat. Wash your hands with soap and hot water before and after working with raw meat.